Going a step beyond a traditional Executive MBA, the Pepperdine University Presidents and Key Executives MBA at Graziadio School of Business is designed for top-level executives charged with strategic decision-making. The program is for students possessing a minimum 10 years of professional work experience, at least one year of which is in a senior executive position. The program can be completed in 15 months; classes meet approximately once a month for a three-day session. There are two intakes of students per year, one in the summer and one in the fall. The program includes a four-day Effective Executive workshop, an immersive two-day ethics Ethics and Law session, an eight-day international session held outside the United States, and an ongoing Business Applications and Strategic Management Project, as well as a Project Seminar to formally present the projects. 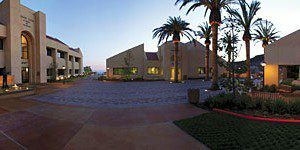 The Pepperdine University Presidents and Key Executives MBA is a 38-unit program, spanning four trimesters. Each PKE MBA class begins with a four-day, live-in effective executive workshop. The workshop reviews the entire program and develops working relationships with faculty and other key resources. A series of projects that ultimately inspire students to develop detailed strategies for achieving the goals of their particular organization is integral to the program. Students complete one project in this series each trimester. Students will participate in an international session, wherein they will spent eight days in a foreign country, connecting with foreign companies, governments, and communities, with the guidance of Graziadio’s faculty. The PKE MBA also features an Ethics and Law session, which provides firsthand experience in issues of morality, ethics, law and criminality. Finally, students complete a project seminar. Students present an oral overview of a refined version of their strategic projects. In Pepperdine University Presidents and Key Executives MBA summer of 2017 cohort, 77 percent of students identified as male, and 23 percent identified as female. Students in the PKE MBA program will have a minimum of 10 years work experience. The Career Portal allows students to search jobs, post resumes, register for career events, and more through this website exclusively for Pepperdine Graziadio students and alumni. Students can take advantage of one-on-one, short-term coaching sessions for guidance on resumes, interviews, career planning, salary negotiation and more. Pepperdine offers career workshops, webinars, career fairs, industry panels, and networking events to help students and alumni further their careers. Though the students in the PKE MBA program will be well into their careers, the curricula in the Executive and PKE programs are geared to ensure students’ success and continued advancement in their companies. In fact, on average, 38 percent of students pursuing their Executive MBA at Graziadio receive a promotion at some point during the program. The average annual salary after the Executive MBA program is $159,963. Tuition costs for the Pepperdine University Presidents and Key Executives MBA fluctuate annually. The approximate cost of tuition per trimester is $37,500. An estimated total cost of tuition is $150,000. Merit-Based Scholarships: The Graziadio School gives motivated students the opportunity to earn scholarships based on their academic achievements. Merit scholarships for Presidents and Key Executives MBA students are awarded based on cumulative GPA, work experience and achievements, and leadership potential. Endowed scholarships: The Graziadio School offers a variety of endowed scholarships for students who meet the specialized requirements of each award. Presidents and Key Executives students should consult their company’s Human Resources Departments to learn whether their company is willing to reimburse full or partial tuition. If students without financial aid are receiving compensation from their employers, the University may allow a deferral of payment. Applicants to the Presidents and Key Executive MBA program must have a four-year undergraduate degree, or equivalent. A minimum of 10 years full-time professional work experience is required for the PKE MBA. To apply to the PKE MBA program, applicants must submit a completed application form, all college transcripts from degree-granting and non-degree-granting institutions, a current résumé, an organization chart that clarifies the employee’s place within the company structure, Candidate letter to Admissions Committee, and two letters of recommendation. The applicant will have two interviews with an executive director, deputy director, regional director, and/or faculty member. Applicants are also responsible for a $2,000 enrollment fee as part of the first trimester tuition, which will be refunded if candidate is not accepted into the program.